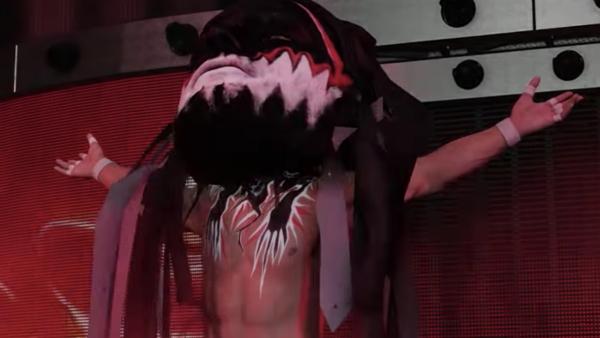 In which Finn Balor becomes an NBA Jam character. Like most major sports game franchises, the WWE 2K series isn’t exactly associated with year-to-year innovation. Developers Visual Concepts typically eschew outright revolution for a glut of incremental annual tweaks. Roster stats are updated, graphics are refined, and pre-order bonuses align with whoever’s being pushed at the time. New features come and go with each new incarnation, but the core game remains largely unchanged. While WWE 2K19 almost certainly won’t reinvent the wheel either (despite the typically overwhelming marketing campaign), it looks like the latest game is about to bring oodles of mad sh*t to the table, with the first batch of trailers peppering the usual vanilla gameplay footage with dashes of complete weirdness. It started with ‘The Phenomenal One’s’ supernatural undertones, and continued through this exclusive IGN feature reveal and a new MyCAREER preview. Who knows how prevalent they’ll be in the final form, but for now, it looks like the developers have lost their minds this time around.